We live in a high-tech world, but the value of hand-written notes cannot be forgotten. Not a day goes by that we don’t hop online and encounter yet another blog entry about how technology has improved someone’s business practices. or made life easier in one way or another. I totally get that – and I agree! Technology is wonderful and has done so much to improve the way we practice in all business types. I could go on and on about the ability to electronically sign documents or the latest app I use to make life and business easier, but not today. I want to focus on avoiding reliance on a tablet or a smartphone to make your business world go ‘round. 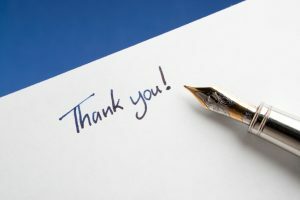 The art of a hand-written note seems to have gone by the wayside these days, and is a heartfelt way to reach out to clients. If you really think about it, all of us in the real estate business are small business owners. Some of us work for larger brokerages, others, like me, are independent brokers. But we should strive to show current and future clients that we going to go that extra mile and be more attentive to their needs over that other guy up the road. Our careers depend on lasting relationships and lasting impressions. You have heard it said a million times, that the word-of-mouth referral is the best compliment anyone can give you. However, in order to get those referrals and keep folks coming back, your clients have to remember you. You must nourish those relationships, and that’s the tricky part. Let’s face it, there’s only so much we can do while actually working on a transaction to set ourselves apart from the next broker or Realtor. Now, I know hopping on a laptop, a tablet or your smartphone makes it really easy to call someone, send a text and hammer out a quick email saying “thank you” and “hello.” But how thoughtful is that? How much effort went into a task that is simply second nature these days? Moreover, how easy is it for the person you are trying to reach to not pick up your phone call or miss your text or email? I know I get countless text messages and emails on a daily basis, and rarely do any of them stand out as being extraordinary. My solution: quality stationary, good penmanship and a signature style that is all your own will show someone the class and detail you entail within your practice. Personally, I use a classic Waterman fountain pen and write in my own signature ink color that is cohesive with my branding and marketing for my brokerage. A note doesn’t have to be long or exaggerated, rather simple and to the point. How simple? My notes are sometimes as simple as a compliment on their new home if I drove by, or a simple one-line message saying “thank you.” Nothing says you took a little time out of your day to think about someone more than a hand-written note. And yes, it will be delivered to their mailbox and they WILL open it. You know as well as I do, it is pleasant to receive snail mail. Not bills and the like, but when you get a hand-written note, addressed to you, you get a little excited and you appreciate the fact someone knows your name and took to the time to properly acknowledge you. I cannot tell you how many compliments come from these simple notes. Do yourself and your business a favor and invest in your brand. Make yourself stand out from the crowd of other brokers and Realtors. Make a pledge to sit down and pen three to five notes a day to a potential, current or past clients. You will be surprised how far this simple gesture will go in maintaining your client relationships. Subscribe to our newsletter and stay in the loop with the latest developments from Jaron Hall Properties.